On the evening of April 27 social media was lit up with messages of love and hope from Keep Memory Alive’s Power of Love Gala at MGM Grand Arena where donors were pouring money into an organization that famously delivers love and hope. Dr. Jeffrey Cummings, the center's director of the Lou Ruvo Cleveland Clinic Center for Brain Health. On the evening of April 27 social media was lit up with messages of love and hope from Keep Memory Alive’s Power of Love Gala at MGM Grand Garden Arena, where donors were pouring money into an organization that famously delivers love and hope. The annual fundraising gala for the Lou Ruvo Cleveland Clinic Center for Brain Health (where seats begin at $1,500) brought celebrity performances and heartwarming stories about health care and memory. When former tennis champ Andre Agassi donated $1 million to Keep Memory Alive after receiving the Community Leadership Award that night, the applause rippled throughout Las Vegas. The event is an annual celebratory reminder of how warmly the community embraces the Lou Ruvo Center and its dedication to research and care for patients with Alzheimer’s, Parkinson’s, Huntington’s and other brain-related issues. Keep Memory Alive and the Lou Ruvo Center, founded by Larry Ruvo and dedicated to his father, Lou, who died from complications from Alzheimer’s disease, have brought international attention to Las Vegas, not only for the Frank Gehry-designed building, but for what’s happening inside of it. Since opening in May 2010, the outpatient treatment and research facility has become home to one of the nation’s largest clinical trial sites focused on neurocognitive disorders such as Alzheimer’s and Parkinson’s, and it remains dedicated to understanding brain diseases, including long-term effects of repetitive head trauma. Its Professional Fighters Brain Health Study is in its sixth year, and the Lou Ruvo Center dedicates a generous amount of time and energy to programs for caregivers. Grants allow for groundbreaking research by its top specialists. Think tanks and special events bring in academic and pharmaceutical experts discussing various brain diseases and head trauma. 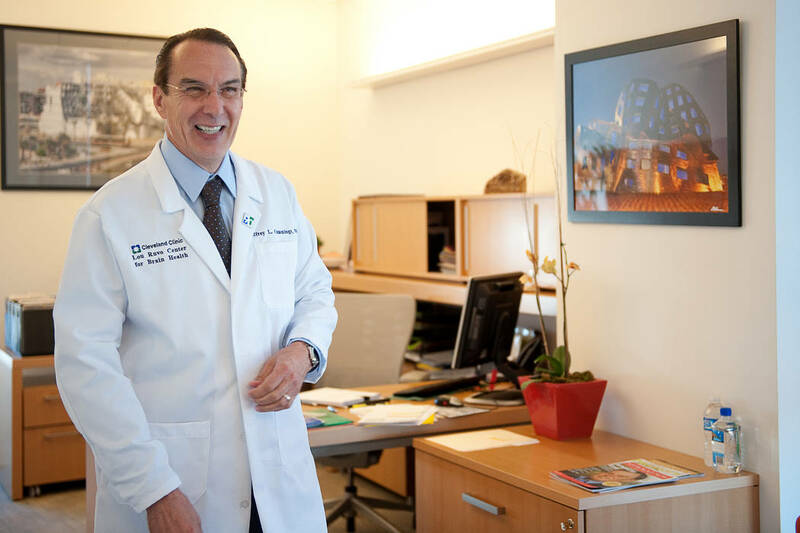 “Innovation is a core value at Cleveland Clinic Lou Ruvo Center for Brain Health and is applied every day as we continue our mission to provide unparalleled patient care to those living with neurological diseases including multiple sclerosis, Parkinson’s, Alzheimer’s and Huntington’s disease and for the family members of those who suffer from them. Our physicians and caregivers are committed to developing new procedures, building new tools and making decisions that will result not only in better patient outcomes and experiences but will accelerate us on the path of discovery as we continue to search for a cure,” said Dr. Jeffrey Cummings, the center’s director. Through diagnostics, memory and neuropsychology testing, brain imaging, treatments, trials, physical therapy and rehabilitation programs, as well as support services for caregivers, its broad community reach and depth of care, Lou Ruvo Center remains a well-supported institution in Las Vegas, stemming entirely from a businessman who wanted better options for patients and families.